Balsa wood blank, fibreglass, plywood fin (not fibreglassed) set through thr board. The blank has a off-set central 8'' block with two 4'' strips to the right (on the deck) and two 3'' strips to the left. 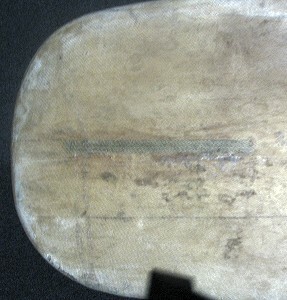 The two internal narrower strips are joined by a mitre about the mid point. 8'' x 8'' base x 10'' span @ 2''. 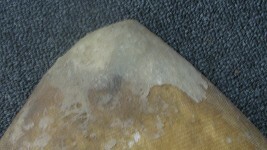 The fin is mitred through to the deck of the board and the base is fibreglassed, but the majority of the fin is not. Tail profile showing fin base mitred through the deck of the board. Dimensions and photographs taken at Aquatique Core Surf Shop, East Street, Nowra, 2nd November 2007. "The board was purchased from Mick Symonds Sports Store, Sydney, in 1956. The sales staff indicated it was one of ten boards imported into Australia from Hawaii by the company." Mick Simmons was a famous sportsman at the turn of the century and the company is probably Australia's longest surviving sports retail store. Over the years they provided an extreme range of products and services. Mick Simmons Sports Store was originally located in George Street Sydney and famous in Australian sports history as the early supporter of a noted cricketer, Don Bradman. A 1948 full page advertisment for Mick Simmons' Sports Stores includes "The Winner" a surfmat described as a "canvas and rubber inflated surfboard', priced at 67/- (67 shillings)". "Al was born on the 4th August 1936. He was good at sports at school, particulary swimming ,sprinting and gymnastics. Al also recalls having a natural aptitude for climbing trees...He spent 10 years riding and racing push bikes all over England and Europe. After retiring from bike riding at the "ripe old age of 26" he came to Australia as a tourist in August 1961. It was at Bondi, where he was sharing a flat, that he saw the first of the malibu surfboards and thought "that's for me" he went out and bought a balsa board from Mick Simmons in Sydney and took to the water. "I found out it was a bit harder than it looks (eds note: nothings changed in that department Al) ...and "after surviving a few near drownings, put in the time necessary to master this new sport" Al has also dabbled in sailing and orienteering, but always liked to jump in for a surf on the board." Printed by Sheperd and Newman, Sydney. Everything for every sport. Toys for every child. (. With num. text-illusts., and adverts., some in col. The board is extremely thin and very light. It only has one layer of fibreglass that has a roughly trimmed overlap most noticeable at the tail. 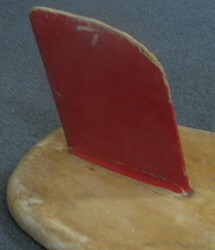 The setting of the fin through to the deck is unusual. The absence of fibreglass on the main body of the fin is structually questionable. 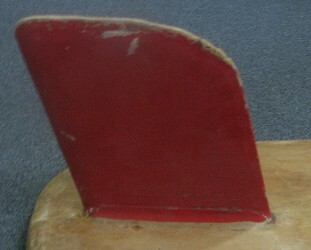 Although the paint on the top of the fin has worn off, exposing the timber to water, the lack wood rot indicates the board probably did not have a lot of use. The board closely corresponds with the plans and construction technique described by Matt Kilvin in 1954. Photo shoot at Aquatique Core Store, Nowra. Geoff Cater (2007-2014) : #330 Balsa Malibu, 9ft, 1956.